There are many theories that date back hundreds of years but no one knows exactly when green and red became a Christmas symbol. What is known is that predating the observance of Christmas by several hundred years, the Romans celebrated Saturnalia, which honored the god Saturn, starting with the reign of the Emperor Augustus (64 BC-AD 14). Saturnalia began as a 2 day festival but gradually morphed into a week long event. Changes to the Roman calendar moved the peak of the festivities of Saturnalia to December 25th, just after the winter solstice. During that time, holly wreaths were given as gifts. During that time of the year, female holly bushes / trees were normally covered with red berries. Even though most religious scholars believe the birth of Christ took place in the spring, in the 4th century leaders of the Catholic Church decided to celebrate the birth on December 25 to rival the pagan religion that was threatening Christianity’s existence. According to the BBC Religion - Christmas Traditions: It is said that only the holly tree consented to be cut down and its wood made into a cross to bear Jesus. Some Christians believe that Jesus wore a crown of holly thorns whose berries were originally white. As Jesus’ blood touched the berries, they turned red. The green leaves of the holly plant have come to represent everlasting life and the berries the blood of Jesus. Many historians believe that the likely root of the red and green Christmas tradition dates back to the 1300s when Adam and Eve’s Day was celebrated on December 24. Traditionally on this day a Paradise Play was held depicting the story of Adam and Eve in the Garden of Eden. Because an apple tree figures greatly in the story (and there were no apple trees loaded with fruit at that time of the year), a pine tree with red apples fastened to the branches was used to represent the Tree of Good and Evil. Churches began adding trees with red apples into their Christmas decorations. Because of this, an apple decorated pine tree in the home became very popular, especially in Germany. The idea spread and both Christmas trees and the color combination of green and red remain popular today. 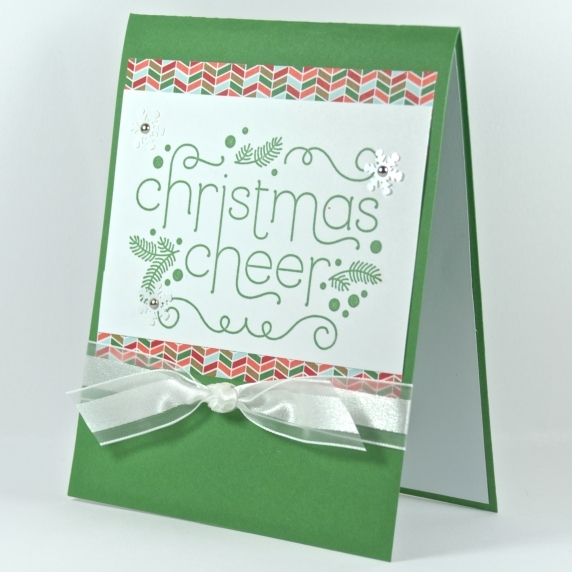 Green, red and white "Christmas Cheer" greeting card with snowflakes handmade by Lisa of Cards by Li Be! 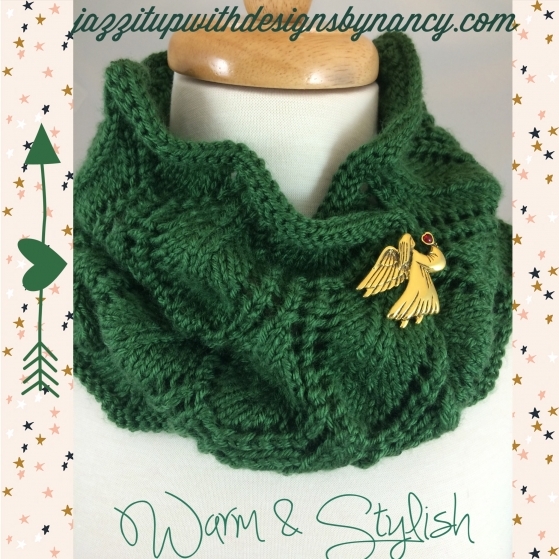 If you are interested in my last blog, "Not So Simply Red" featuring handmade holiday items in red, please click this link: "Not So Simply Red - Wonderful Handmade Wednesday"
I hope you enjoyed these gorgeous green handmade selections! If you would like to make my day and the day of the artists featured, please leave a comment. And any promotion you can do will be greatly appreciated. Thanks! 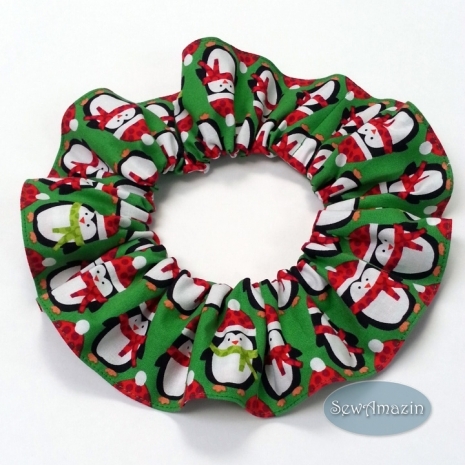 Thank you, Catherine, for including my Penguin Scrunchie Ruffle among your choices of gorgeous green gift ideas this week. Have pinned them all! Glad to have included you penguin ruffle, Donna! Many thanks for pinning the items! Green is especially nice in winter because it keeps the hop of spring alive. I love winter but spring is always welcome. here in verdant West Virginia, things get as green as Ireland. Thanks for sharing all the beautiful green items! I loved seeing and pinning them! Have a great holiday! Yes, green always means hope, Jo! Thank you for stopping by and leaving a comment! It's always so interesting to read your posts and I learn new things each time. 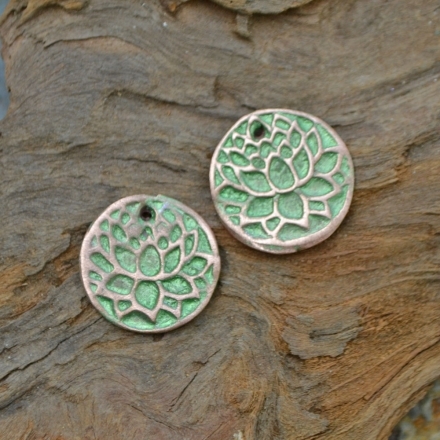 Thank you for including my ceramic earring charms in this post. 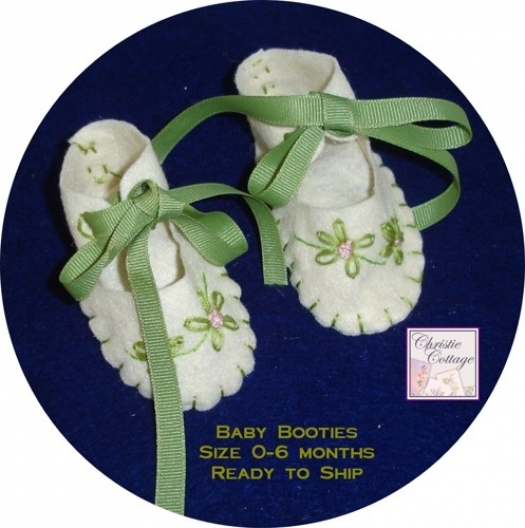 And omg, those baby booties are adorable! Am so glad you enjoy the posts, Linda! Thank you! Thanks again for an interesting and beautifully illustrated post about seasonal colors. 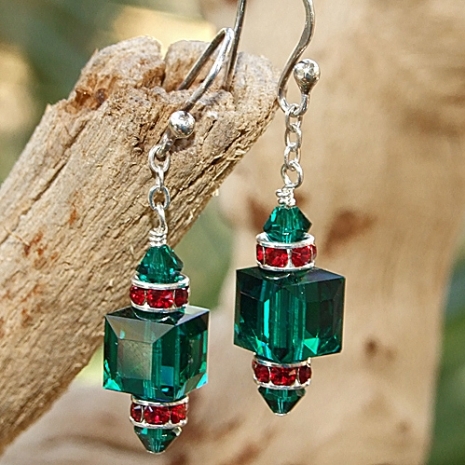 I love green for any season and your handmade selections this week would be perfect for Christmas. Thanks for including my shop. Appreciate the kind comments, Pamela. Thank you! 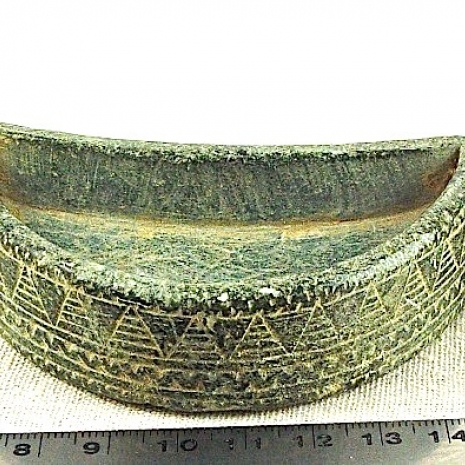 Thank you for including my Bactrian bowl in such an array of gorgeous greens. Many happy years to you and your family, Catherine! It's always a pleasure to include on of your fascinating pieces, Anna. With your extremely busy days, many thanks for stopping in and leaving a comment. i LOVE these Gorgeous Greens!!! Oh Catherine! These Greens are So Beautiful!! 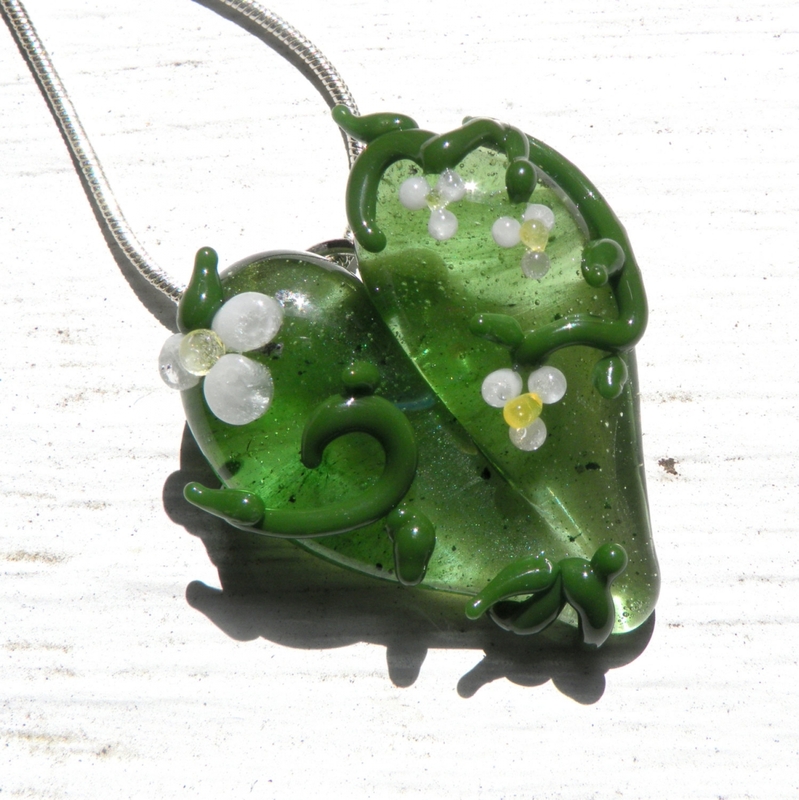 The Lampwork Heart, the Baby Booties....just Everything is So Lovely!!! 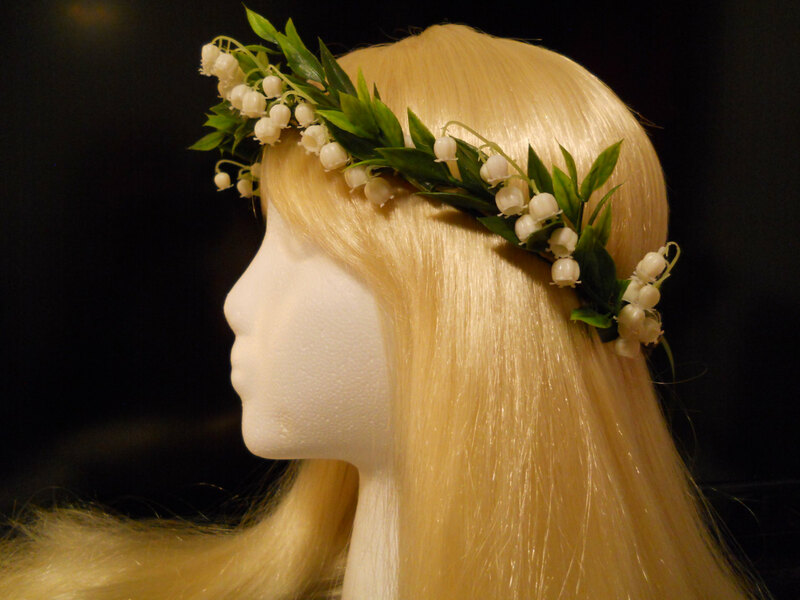 Thank You for getting me into the Christmas Spirit and for including my Lily of the valley Wreath! Wishing Everyone a Happy Christmas!!! Am so glad you enjoyed the post, Michele. It's always a pleasure to highlight wonderful artists. Happy Holidays to you, too! Always a treat to read your research on such a variety of topics. Thanks for the education about the various meanings behind the Christmas green and red colors. Of course, you have selected a wonderful collection of items here to represent those colors and I thank you for including my Christmas card. Am so glad you enjoy the posts, Lisa. Must be the teacher coming out in me - LOL! Many thanks for your comment and for sharing. 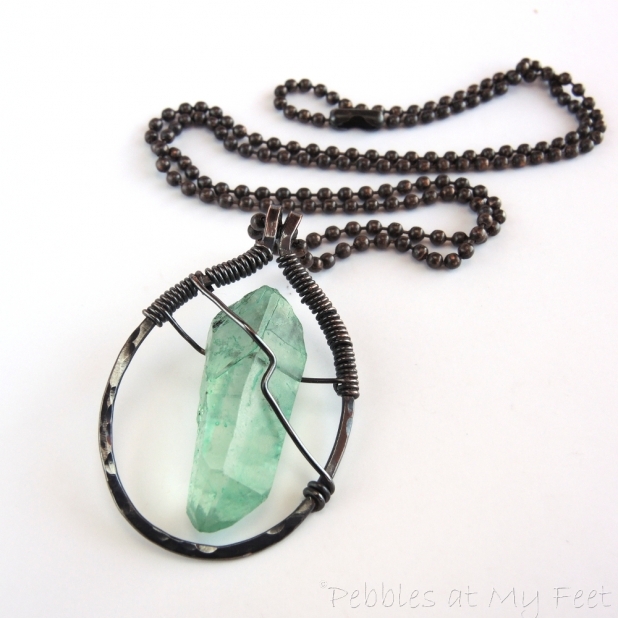 Such a beautiful collection of handmade green goodness! 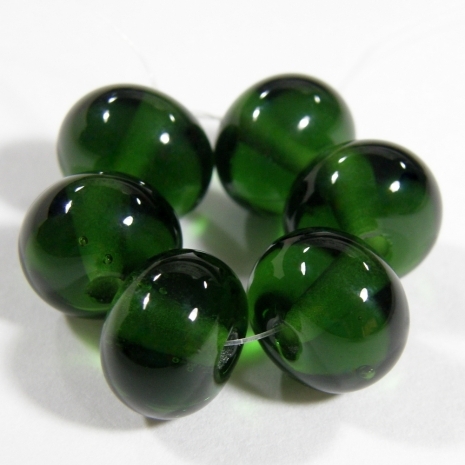 Thanks for including my green lampwork beads. Green Goodness, indeed! Many thanks, Charlotte, for stopping by. 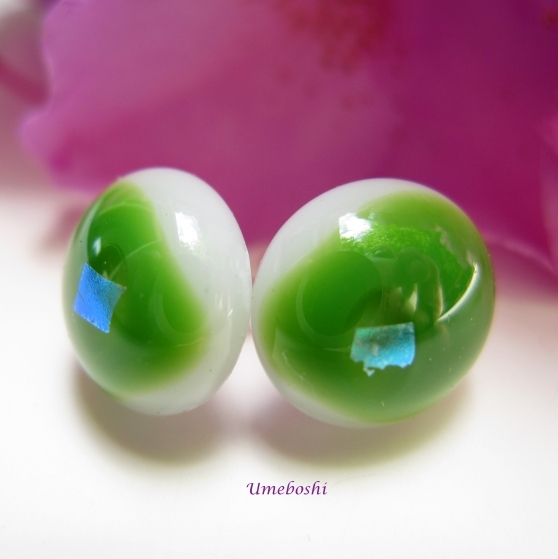 Green is my favorite color and it was a pleasure viewing these great item! 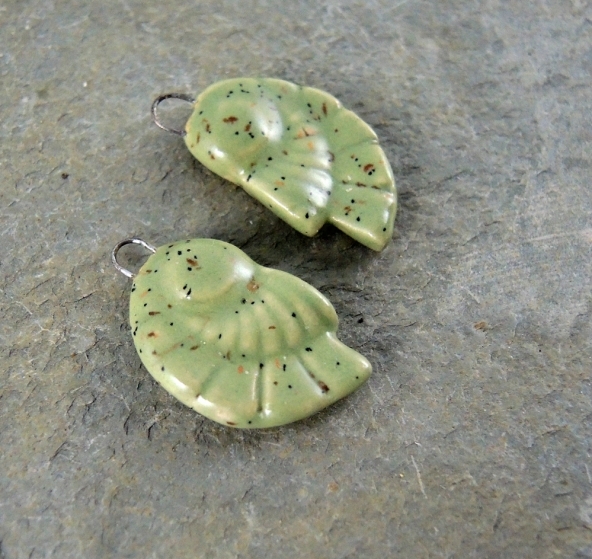 Glad you are now on Indiemade, Jacki! Thanks for stopping by and leaving a comment!